We hope you’re ready to kick putt, Darlinghurst, because Sydney’s sweetest mini golf experience has expanded. If you’ve ever harboured dreams of being Happy Gilmore, now’s your chance. 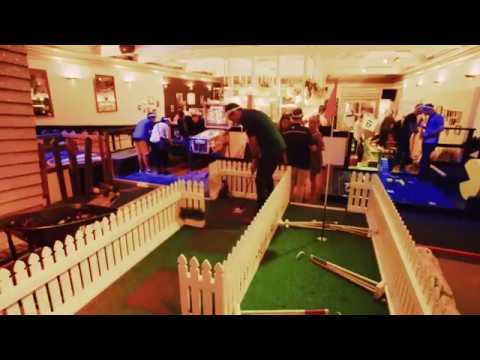 Holey Moley Golf Club has teed off in Darlinghurst! With 27 themed holes, over three courses, sprawling two levels, you’re in for the craziest round of mini golf you’ve ever played. Feelin’ thirsty? Pull up a seat and settle in at The Caddyshack. With cocktails like Teeyoncé Holes and The Sugar Caddy, Holey Moley’s fully-equipped bar has you covered, and their kitchen will take care of even the pickiest taste buds. We are open as normal over the holiday period except Good Friday April 19th. We will be open Midday - 10:00pm. We've got $20 Pimms Jugs and $5 beer, wine and spirits on offer from 3pm - 7pm Monday - Friday. Swing into the week with our Monday Funday deal. All day Monday grab unlimited Mini Golf for only $10! plus $5 basic beer, wine and spirits. Universi-tee off from 7pm Wednesday, with 9 Holes of Mini-Golf for $8 when you bring your Tertiary ID along. We'll also throw in $10 Margarita Pizzas. Cheers to that! All day Sunday, spend $7 on Food or Drinks and we’ll give you 9 Holes of Mini-Golf for free so you can really putt loose! Okay, let’s get to the point. What's the deal with alcohol at Holey Moley Darlinghurst? The rumours are true. We have a fully licensed bar and a delicious list of cocktails. You ALWAYS need to bring a valid for of ID to enter our Darlinghurst venue and make sure it is readable electronically as all IDs will be scanned as of 9pm. No paper IDs will be accepted (Even if you think you are too old, this also applies to you). What can we do before and after the golf stuff at Holey Moley Darlinghurst? How do I book at Holey Moley Darlinghurst? Why won’t your site let me book everyone in at Holey Moley Darlinghurst? Can I wear my golf outfit from home to Holey Moley Darlinghurst? How long does the golf stuff take at Holey Moley Darlinghurst? What if I wanna bring the whole squad to Holey Moley Darlinghurst? Can I bring the kids to Holey Moley Darlinghurst? Can I just turn up to Holey Moley Darlinghurst? Can I cancel or change my booking to Holey Moley Darlinghurst? How do I get to Holey Moley Darlinghurst on public transport? Jump on the train and hop off at Kings Cross Station. We are only a two minute walk from the station! Jump onto the NSW public transport journey planner here and map out your journey. Where do I park at Holey Moley Darlinghurst? The Wilson Parking located on Ward Avenue, Elizabeth Bay is the best place to drop your buggy. Can I use my foreign passport or drivers license as ID to enter Holey Moley Darlinghurst? Foreign passports and drivers licenses will only be accepted if they are scannable cards, no paper one's will be accepted. Do I need to bring my ID to Holey Moley Darlinghurst? Yes - Anyone who looks under 25 years of age will need a valid form of ID to enter the venue after 5pm. We accept valid driver or rider licences and permits issued within Australia or any foreign country, Australian and International passports, NSW photo cards, proof of age cards and Keypass identity cards.